“We’re not going to be able to go far with all these trees,” Drummond said. They’d had the identical conversation a minute ago. 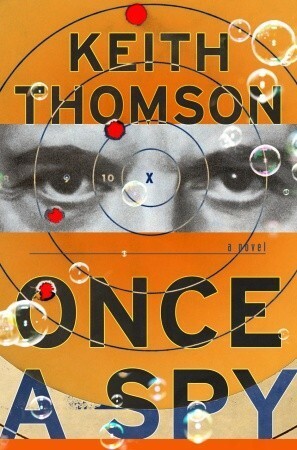 Once a Spy by Keith Thomson is a mildly amusing thrilling ride that was fun to read. I stumbled onto a good story with this one. Intrigued by the description, I wasn’t sure what I was expecting since I don’t read a lot of spy thrillers but the concept was unique and made me wonder how Thomson was going to write it. Drummond, the spy, has Alzheimer’s. His son, Charlie, is degenerate gambler constantly losing borrowed money at the tracks. Together, they’re surprisingly competent at evading spies and criminals while uncovering national secrets from Drummond’s scattered memory. As you can imagine, a spy that starts losing cognitive function might be endangering the country because he could possibly share national secrets with strangers which is why Drummond and Charlie end up being pursued by various secret organizations. The son spends most of the book a little bit confused and out of place which fits quite nicely with his father who may or may not be lucid and any given time. Thomson showcased Alzheimer’s rather well; the confusion, the bits of lucidity, the conversations where no one is sure what decade Drummond is in. From beginning to end the story is filled with action, impossible scenarios, intrigue, and dark humor. Drummond is a bit of a superstar in the spy world but his skills are rather unbelievable for the real world. I will say that Charlie’s incredulous awe of his father was definitely shared by me. Saying “Somehow,” during a fight in reference to Drummond’s ability to shoot without aiming and hitting his target spot on lowers the believability of the story. Thomson has an easy going writing style that is somewhat at odds with the action paced adventure of the novel. It fits for the dialogue, descriptions and navigating through Drummond’s memories but can be a little awkward especially in action sequences. Characters are introduced with lots of metaphors and very short little stories that make readers curious about them. I loved the descriptions of people, their introductions and little tidbits into their histories. Personally, I enjoyed this writing style; it kept me engaged and cheering for the protagonists. The humor was subtle and kept me smiling even if I didn’t laugh out loud. Some of the elements of espionage were fantastical (especially how quickly the son manages to pick it up, decode ciphers, and spot tails and other agents) and with the underlying humor and tone of the book made it seem a little satirical. Overall, I’d definitely recommend this and since I was disappointed that it ended, I’ll be keeping an eyes out for Twice a Spy, the sequel. Drummond simultaneously drew the colt and whirled around. At what proved to be a scarecrow – a good one, replete with dungaree overalls, plaid shirt, worn cowboy had, a hoe that, in the dark, at a certain angle, could be mistaken for a rifle. “If I were a crow, I would have been scared to death,” Charlie said.